It was the hottest day yet of a damp cold summer, and 37 dragon boat teams came to Steveston to enjoy the balmy 25 degreetemperature by the sea. The 2nd annual Steveston Dragon Boat Festival was set at the Britannia Historic Shipyard, locatedjust East of Steveston Village. Top race honours went Team Lifescan who repeated their 1st place finish from 2010 with a time of 2:07.400. 2nd place went to False Creek Grandragons, a seniors team with 2:09.950. And 3rd place overall was a very tight race that saw Swordfish beat Dragon Hearts Beat by 0.28 sec with a bronze medal time of 2:10.84. – said their coach, former Olympic kayak paddler Kamini Jain. should never be underestimated, and how amazing it is that paddlers aged 60+ are beating almost every dragon boat team. This was the last race of the season for the Metro Vancouver area. Many of the teams start practicing in March, and looked forward to the final race of the summer. It was a lively and festive site, set among the heritage buildings that remain from Steveston’s historic Cannery Row. Many of the paddlers learned about the history by reading the display signs, but were still unaware that area they were lining up in was later being used as the setting for the Salmon Row theatre production produced by Mortal Coil. Teams came from as faraway as Ft. Langley and Saltspring Island. Local teams included many different teams including Dragon boat paddling is an inclusive activity with many specialty teams. O2P is a team of paddlers on kidney dialysis, which came 1st in the D Division. Strathcona Dragons is a youth team from Vancouver’s inner city neighbourhood that came 4th in B Consolation. Off Balance is a team that includes paddlers with multiple schlerosis. South America. Our team made it to the C semi-final, but got bumped into the consolation round. 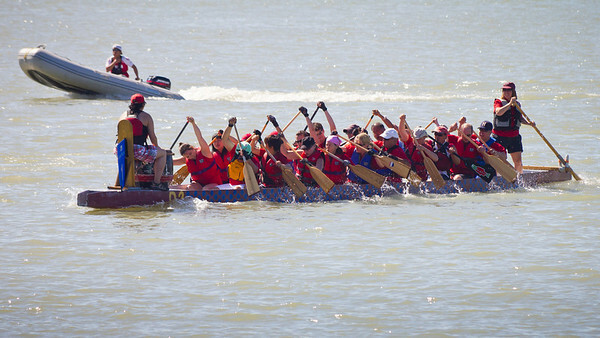 The atmosphere at the Steveston Dragon Boat Race was very friendly, filled with the camaraderie of a full season of paddling. Many teams had started paddling in the wet months of February and March. There were also many new paddlers who only started in July and August. For them, their first race was very exciting. This entry was posted in Dragon Boat Information, Dragon Boat photos 2003, Dragon boat with Todd Wong - Dragon Boat Coach, Gung Haggis dragon boat team information, Main Page on August 26, 2011 by Todd. The Wong or Huang family crest approved and recognized by the Canadian goverment, the project was started by the Wong Association of Ontario. I do like that both bears are standing on a “gold mountain” since “gum san” was what the Chinese referred to America, since the early pioneers came for the California and BC gold rushes. The panda bear is holding a pick axe, to signify that the Chinese pioneers came over in search of gold. The polar bear is holding a sledge hammer to signify that Chinese pioneers also came to Canada to help build the Canadian Pacific Railway. My own grandfather Wong Wah, arrived in Victoria BC in 1882, at age 16. He helped his uncle's dry goods store in Victoria and was soon managing “the largest Chinese dry goods store in Victoria” according to my father. Wong Wah had 6 wives. 3 were in China, 3 came to Canada. My own grandmother was wife #5, and my father was known as #8 son – even though from wife #5, he only had 3 older brothers and 2 older sisters. My friend David Wong, is also a 5th generation Canadian, who was interviewed on CBC Radio One's “Early Edition” program by host Rick Cluff, on Friday morning. “So far no equivalent of the Highland Games are on the agenda. “I don’t think you’re going to get Mah-Jong replacing caber tossing,” says Bonnie Wong. to use the crest as their own symbol, said Caroline Wong. written down wrong by the immigrant officials. Jean Lumb was the first Chinese Canadian to receive the Order of Canada, in 1976. http://en.wikipedia.org/wiki/Jean_B._Lumb She was the best friend of my grand-Aunt Helen. I know 2 of Jean Lumb's daughters: Arlene Chan is a Toronto librarian and author of the dragon boat book: Paddles Up!, while Janet Lumb is the artistic director and founder of Acess Asie (the Montreal equivalent of the Asian Heritage Month Festival). McChan plaid, was created for her. Dinner, turned into a CBC television performance special in 2004. Adrienne Wong is of Chinese-Canadian and French ancestry. She is an accomplished actor and founding director of Neworld Theatre. 1940's. A recent documentary titled Tailor Made: The Last Tailor in Chinatown. Janice Wong, artist and author. Janice wrote the book Chow: From China to Canada, Memories of Food + Family. She was featured in the CBC documentary “Lotus Land Sasketchewan” and Generations: The Chan Legacy. She is my 2nd cousin, as we are both descended from Rev. Chan Yu Tan. Jim Wong-Chu is a Vancouver Chinatown historian, poet and cultural engineer. He edited Many Mouthed Birds, the first book of Chinese Canadian prose and fiction. He is the creator of the North American Asian-Canadian Historical Timeline. He has been the driving force behind the Asian Canadian Writers' Workshop and the Vancouver Asian Heritage Month Society. Paul Wong is the accomplished video artist pioneer. which won the 2008 Dorothy Livesay Poetry Prize at the BC Book Prizes. Vicki Wong is the author/illustrator of Octonauts, and the creator of Meomi Productions which created the mascots for the 2010 Vancouver Olympic Games. Joe Wai, architect, my cousin. His mother was a Wong. Joe is the architect of many projects in Vancouver Chinatown including: Dr. Sun Yat Sen Gardents, Chinatown Millenium Gateway, Chinese Cultural Centre Museum and Archives. This entry was posted in Chinese Canadian History, Main Page, Todd Wong on August 14, 2011 by Todd.